Neutrons was formed towards the end of 1973 and in theory could be considered to be an offshoot of Welsh band Man. The main fulcrum behind Neutrons were Phil Ryan and Will Youatt together with John "Pugwash" Weathers (Drums); Martin Wallace (Guitars) Ray "Taff" Williams (Guitars); Stuart Gordon (Violin) and Caromay Dixon (Vocals). The name of the group came from an original group Youatt and Ryan together with Clive John had, called Iorwerth Pritchard And The Neutrons prior to these three joining Man. Will Youatt started his musical career with the King Bees in 1964, later joined Quicksand and eventually Piblokto in 1970 where he met up with future Neutrons members Phil Ryan, and Taff Williams. In 1972 Youatt joined Man together with Phil Ryan and though a trained guitarist, played bass on two of their albums, Be Good To Yourself and Back Into The Future. Phil Ryan 's musical career also started back in 1964 with the group The Smokestacks, following which he joined highly successful Swansea band Eyes Of Blue who went on to win the Melody Maker Battle Of The Bands Competition. Also present in this band were, amongst others, future Neutron members, Taff Williams and John "Pugwash" Weathers. Ryan left Eyes Of Blue in 1970 to join Piblokto and in 1972 joined Man together with Will Youatt. However things between Ryan and leader Micky Jones came to a head and Phil Ryan announced he was leaving the group together with Will Youatt to form Neutrons. Fellow Welshman John "Pugwash" Weathers joined the group for the recording of the first album. At that particular point in time he was still a member of cult progressive band Gentle Giant, whom he had joined the previous year. His stint with both Eyes Of Blue and Piblokto together with Ryan, Youatt and Williams made him an automatic choice as drummer for the first album of the band. Ironically Weathers would eventually join Man in the late nineties. Weathers also guested on Graham Bond's last album before his demise , We Put Our Magick On You, and for whom Dance Of The Psychadelic Lounge Lizards was dedicated. Bond also knew Ryan and Youatt since he had played the organ on the 1970 Piblokto album, Thousands On A Raft. Ray "Taff"Williams also known as Cue-Tar (due to his strong accent in pronouncing guitar) started his musical career in 1964 with the Mustangs before joining Eyes Of Blue and Piblokto in 1970. Also involved with Neutrons was violinist Stuart Gordon whose previous rock musical experience was playing on the album Earthspan (1972) by The Incredible String Band. Ryan, Youatt and Weathers had already been playing together and thoughts of leaving Man had already crossed their minds towards the end of 1973. Both Ryan and Youatt had had enough of the extensive touring that the Welsh group undertook to promote its albums and Ryan in particular was feeling stifled with the inability to fully express his musical ideas as they had to fit the Man style of music. Living In the World Today and Snow Covered Eyes (both tracks would end up on the debut album) were recorded in November 1973 by the trio at Rockfield studios near Monmouth and played to United Artists A&R man Andrew Lauder who immediately expressed an interest in the group. This was the perfect excuse for Ryan and Youatt who immediately set about leaving Man to form Neutrons. The second recording stint involved another fortnight of recording and took place in April 1974 at Chipping Norton Studios, and this time the group was fully assembled with Taff Williams, Stuart Gordon and other guest musicians. Amongst these musicians were Caromay Dixon, Martin Wallace and Dave Charles all of who would be permanent members of the band by the second album. Mixing was done at Olympic Studios in Barnes with the album released in September, 1974 as Black Hole Star ((United Artists UAG 29652; valuation with inner sleeve 15.00 BS). The single released from this album was Dance Of Psychedelic Lounge Lizard/Suzy And The Wonder Boy (United Artists UP 35704; valuation 4.00BS). Suzy And The Wonder Boy never made it onto any of the group's LP's. There are some interesting notes regarding this album especially with regards to the album sleeve. As can be verified when one reads the inner sleeve, the original intent for the album was to have a gatefold sleeve illustrating the Black Hole theme coupled with the Neutrons logo designed by Rick Griffin. However, the end result did not fit the cover and could not be used. 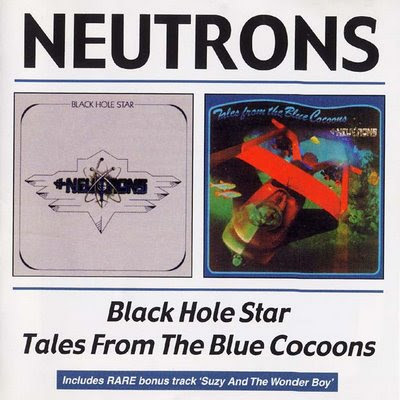 The demo copies of the album involved the record packaged in a silver sleeve and the group also possessed promotional silver stickers of the Neutrons logo. Thus the whole concept was changed with the album packaged in a silver cardboard sleeve. In fact the inner sleeve credits the front and back cover paintings to Paul Whitehead (paintings which are non-existent) as well as an Inside photo which ended up being placed at the back of the sleeve. Only the Kevin Doyle-designed inside bag survived from the original plan, yet side two of the records has the original album number UAG 29651 cancelled out on the run out of the record groove. Other details regarding the album are the inclusion of certain relatively and other lesser known guest musicians on the album. Looking through the tracks on the album, one can see that Feel has a certain Pique on hand drums. This is none other than Pique Withers who also played on the seminal Spring album, and would later surface under a differently spelt first name as Pick Withers as drummer for Dire Straits in later years. Furthermore, the backing vocalists on Going To India labeled as The Quickies, are none other than Will Youatt's former group Quicksand. Less than a year later, in April 1975, the group released their second album Tales From The Blue Coccon (United Artists UAG 29726). Once again recordings took place at Rockfield studios near Monmouth during two sessions in June and November 1974 while mixing took place at Olympic Studios and Advision, London.. According to Phil Ryan the name of the album was a satire on the titles with which various other progressive outfits were naming their albums, most notably Yes with Tales From Topographic Oceans. In fact the album sleeves depicts underwater scenes. On the other hand, he was extremely disappointed with the Pierre Tubbs-designed cover as his original idea was to have a shot of hundreds of people in sleeping bags on the bottom of the sea or under the water. This idea came to him while he was watching the Woodstock film which has a helicopter shot of the field of people present all in blue sleeping bags, looking like cocoons. The album also brought with it a change in line-up from the debut album. John "Pugwash" Weathers could no longer retain his drumming duties with the group and his place was taken/shared by Dave Charles, who had also guested on Black Hole Star, and Stuart Halliday. Weathers would eventually end up playing with Man (as well as Will Youatt and Phil Ryan) in the late nineties. Dave Charles' previous stints included playing with Help Yourself, The Flying Aces with Martin Ace and Deke Leonard's Iceberg. Also Stuart Gordon was no longer featured in the lineup, his place left void and thus the string effect lost from the album. Gordon would remain playing as a successful violin session musician till this very day with various artists such as Tori Amos, Peter Hammil and most recently with Peter Gabriel on the album Ovo:The Millennium Show. However all was not well within the Neutrons camp. Though it was not apparent that Ryan and Youatt were having personal differences, they clashed over each others decisions especially musical direction. Whereas Youatt wanted to move in a more rock-orientated direction (something which he would do with his next band Alkatrazz), Ryan was content to explore that musical sector which the first album was immersed in. To further complicate matters, Youatt fell ill with exhaustion towards the end of the production stages and was not present during the mixing sessions. Inevitably some of the finished product was not what he quite expected it to be. Further evidence of the friction between these two leaders of the group can be seen in the song writing credits. Whereas the first time round the two were involved in practically every song together, this time they could not even collaborate on one single track. Shortly after recording Tales From the Blue Cocoons, the group hit the road but almost immediately were hit by the departure of Taff Williams whose replacement was Richard Treece, a fellow band member of Dave Charles in Help Yourself. However, this was the beginning of the end for the group and by the end of 1975 the group had completely disbanded. Will Youatt formed Alkatrazz with former Quicksand member James Davies. Though they promised a lot, the group only managed one release Doing A Moonlight, yet this clearly showed the rock guitar-based direction Youatt wanted Neutrons to move in. Unfortunately a strange publishing deal that he signed does not allow him to use his name for any material that he wrote with Man, Neutron and Alkatrazz. Phil Ryan started working on a solo album called Road Of Cobras but rejoined Man in 1975before it could be released. The Welsh Connection album featured many of the songs and ideas intended for that album. However he did not rejoin for the 1983 reunion as he continued to work with lyricist and former Piblokto leader Pete Brown. In the eighties he relocated to Denmark but joined up with Man in 1996 when invited to replace the sick Deke Leonard and has remained with the group ever since. Following Neutrons, Taff Williams continued playing as a session musician, Caromay Dixon's musical career would not progress much further than a stint with Global Village Trucking Company on their self-titled 1976 album while Stuart Halliday played with Will Youatt in Alkatrazz. For David Charles, Neutrons was just a stepping stone for a future as a session drummer (Jeff Beck, Airwaves, Dave Edmunds) and as an engineer/producer (Jeff Beck, Judas Priest, The Charlatans, The LA's). Unfortunately, this group which released some good music in the early seventies has not been given the credit it is due. They form an integral part of the Welsh Progressive/Psychedelic scene which was so very promising during those years yet much to my dismay they are practically untraceable both in musical history annals and within the recording industry. Many Thanks for this - a really interesting pair of albums, well worth a listen.